You have all seen so many pics from the zoo, so I decided to post this one. One that is not there every time you go. 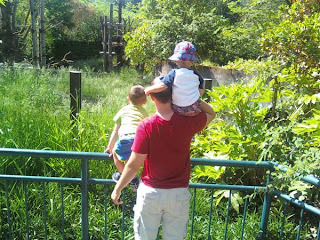 Here they are looking at the monkeys. It was so cute to see the boys so inquisitive at each exhibit. They would diligently look for each animal. I love all 3 of my boys so much. Chris was so helpful and wonderful today. I am so thankful for a wonderful hubby. He loves Jesus and his family so much! These boys are never short on love. Anyway, the zoo was fun. Hopefully we'll go one more time before Gracie comes. Speaking of Gracie, I got a call from the hospital today and my c-section is scheduled for June 19th at 10am. YAHOO!!! That means I have 18 days (or less) until we get to meet her.